Luton boxer Sam King got his year off to a flying start by winning his first ever fight at England Youth level. The teenager, who was making the step up from the Junior ranks, is now boxing three minute rounds, instead of the two minute ones he had been used to. However, King showed he could cope by beating the highly rated Ukrainian Denys Monastyrov in Hertford on Saturday. This international bout was designed to be King’s toughest test to date against a vastly experienced opponent who came into this contest having had 43 fights and is part of his country’s national boxing team. Monastyrov certainly turned up ready to fight and played his part in what was an explosive encounter from start to finish. Round one saw both boxers try to dominate the centre of the ring and it was clear from the onset that spectators were in for a fantastic showcase of top international boxing. King fought to instruction from his coach Sab Leo and kept throwing upper cuts off the jab which midway through the round started to land and shake the Ukranian as the first round went King’s way. The second round saw Monastyrov simply refuse to take a step backwards as he came at King with everything he had and attempted to try to turn the bout around by putting the Lutonian under intense pressure. However, King’s resilience under this type of pressure was admirable as he met fire with fire, matching the Ukrainian punch for punch in a round that was hard to separate. Going into the third round both boxers were very much still in the bout and like the previous two rounds this was another fiery exchange. It was King, boxing behind a long jab, who began to shine through towards the end of this epic encounter and in landing the cleaner shots was awarded the win. Afterwards. King tweeted: “I boxed my first fight as a youth doing 3 minute rounds against a fantastic boxer from Ukraine. 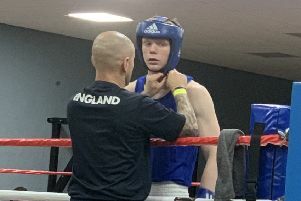 The fight was perfect preparation for King who is due to box in the Home Counties final on Sunday in a bid to retain his lengthy status as Home Counties champion.